Francis Crick studied physics at University College London, obtaining a BSc in 1937; he started research for his PhD under Professor E. N. da C. Andrade, but this was interrupted by the outbreak of war in 1939. During the war he worked as a scientist for the British Admiralty, mainly in connection with magnetic and acoustic mines. He left the Admiralty and went to work at the Strangeways Research Laboratory in Cambridge, supported by a studentship from the Medical Research Council (MRC) and with some financial help from his family. In 1949 he joined the MRC Unit headed by M. F. Perutz. This Unit was for many years located in the Cavendish Laboratory Cambridge, but in 1962 it moved into a new building - the Medical Research Council Laboratory of Molecular Biology - on the New Hospital site. He became a research student for the second time in 1950, and obtained a PhD in 1954 with a thesis entitled `X-ray diffraction: polypeptides and proteins'. Prior to starting his PhD, Crick worked with W. Cochran and V. Vand on the general theory of X-ray diffraction by a helix and, at the same time as L. Pauling and R. B. Corey, suggested that the alpha-keratin pattern was due to alpha-helices coiled round each other. 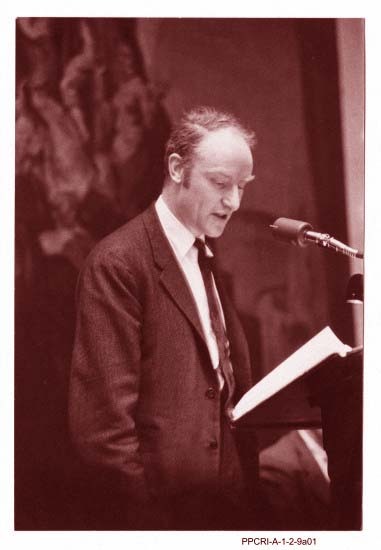 His friendship with J. D. Watson began in 1951 and was a critical influence in Crick's career. Their work led in 1953 to the proposal of the double-helical structure for DNA and the replication scheme. Crick and Watson subsequently suggested a general theory for the structure of small viruses. In later years Crick concentrated more on biochemistry and genetics, leading to ideas about protein synthesis (the `adaptor hypothesis') and the genetic code, and in particular to work on acridine-type mutants. He was made an FRS in 1959. He was awarded the Prix Charles Leopold Meyer of the French Academy of Sciences in 1961, and the Award of Merit of the Gairdner Foundation in 1962. Together with J. D. Watson he was a Warren Triennial Prize Lecturer in 1959 and received a Research Corporation Award in 1962. With J. D. Watson and M. H. F. Wilkins he was presented with a Lasker Foundation Award in 1960. In 1962 he was elected a Foreign Honorary Member of the American Academy of Arts and Sciences, and a Fellow of University College London. He was a Fellow of Churchill College, Cambridge, in 1960-1961, and was a Fellow of the Salk Institute for Biological Studies, San Diego, California.